Big Island Farms is an agricultural based internship program. Built on the platform of experiential education, Big Island Farms offers opportunities for young adults to become stewards of the land and build upon their knowledge, spirit, and passions while gaining palpable degree related experience. As the Social Media Director, it was my foremost duty to capture and share the experience enjoyed by each Big Island Farm intern. Ultimately, every smile, lesson taught, and adventure encountered would be used to weave the identity of the Big Island Farms brand. My intention was to tell a story that would honor our the land, Hawaiian heritage, past interns and educational directors, while filling future interns with enthusiasm for the experience to come. I began the journey of reimagining the brand by first, holistically considering each facet of how Big Island Farm was currently representing itself online and engaging its digital community. Eventually, this query evolved into a forty-two page marketing plan. Everything from Big Island Farm's mission statement to the future content schedule was covered in-depth. 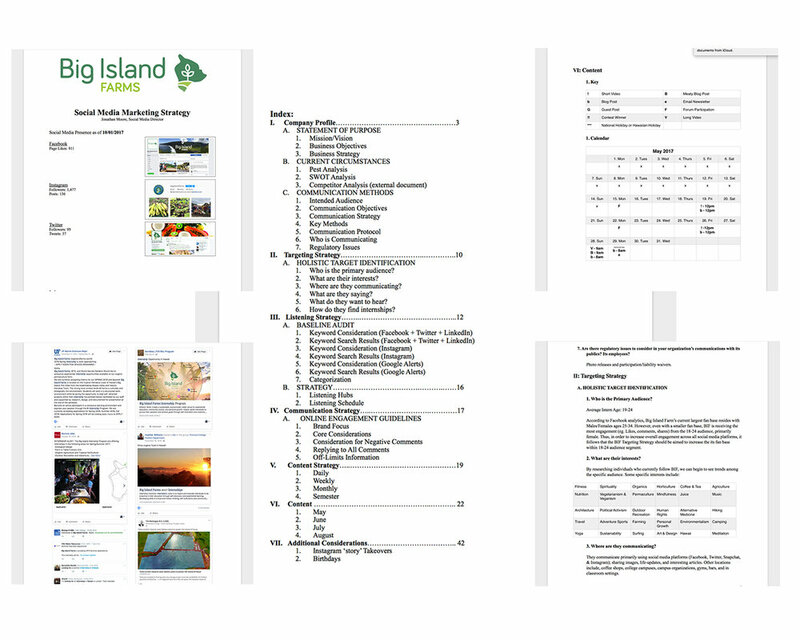 Upon completion of extensive keyword research and the implementation of a rigorous social listening strategy, I completely overhauled each of Big Island Farms media accounts. 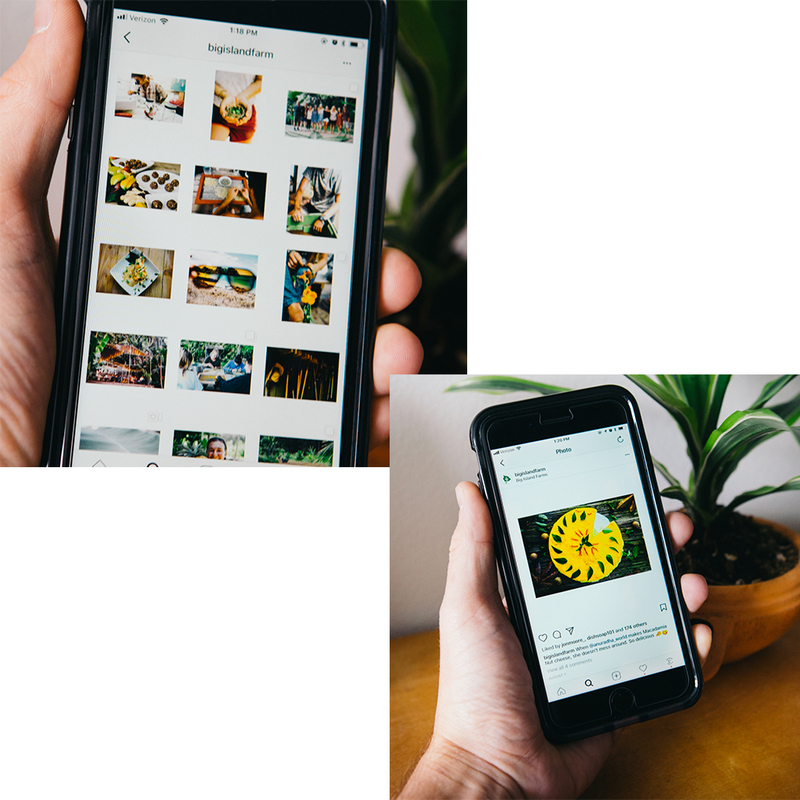 I worked to build a consistent, vivacious feel and brand image across Instagram, Facebook, Twitter, and Linkedin. The Result: Big Island Farms experienced an organic 1,000% increase in traffic across all accounts. Each week, I also worked with a team of interns to include an intern photo feature on Instagram as well as a intern led blog post. During my time with Big Island Farms, I populated their online database with over 1TB of high resolution photographs ranging from landscapes to food. In addition to photography, I also filmed, edited, and produced three short films aimed at showcasing individual programs. You can find my content work featured across all Big Island farms marketing platforms and advertising materials; Web, Instagram, Twitter, Facebook, Newsletters, and Email Campaigns. After two months of managing the social media accounts for the company, I was approached by the owners of the farm to head a complete redesign of the Big Island Farms website. I started with a wire frame of the sales funnel and then fleshed out each page after gaining valuable insights from interviews with current interns. The design itself was built on a Wordpress platform, using a color palette of green, gold and white, and designed to embody the following traits: Bright, rejuvenating and fresh.